Rachel Gallagher is a London-based artist who produces abstract work depicting time and place. She exhibits regularly in London and Ireland, and has work in a number of public collections. Rachel wanted a minimalist website, with the focus on her paintings, rather than displaying large amounts of text. She was looking for a clean use of white space, and clever transitions between her collections of paintings. As the delivery of the site had a short turnaround, we started the project with a workshop session with Rachel, which greatly helped in defining exactly what Rachel was looking for. We also used this time to discuss with Rachel how best to tackle the usability and functionality. As the site is so minimal, we researched and focused on the user experience of the site, using details such as animated transitions to create a subtle and gentle display space. We developed a completely bespoke website, tailored entirely to Rachel's specific needs and requirements. The website is responsive, meaning that it loads smoothly on any size screen, including tablets and mobiles. 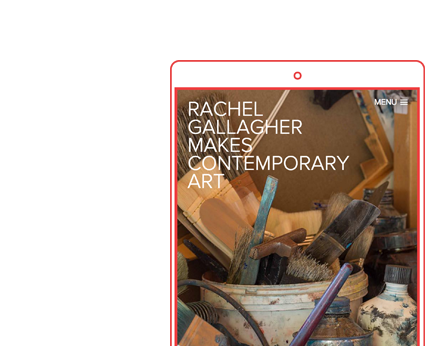 The website perfectly complements Rachel's artwork, with white space to offset her abstract painting style. The website also integrates a blog and news page, which Rachel can update and manage herself. This allows her to share news of upcoming or current events and exhibitions with her audience.